NESTers begin to dig looking for eggs. With just enough time to haven fall into a deep sleep, the nest hotline rang around 3AM. 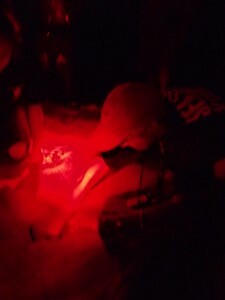 Some late night beachgoers taking one last walk on the sand came across a large turtle emerging from the ocean. Knowing she could abort her mission at anytime before deciding to lay eggs, they quietly backed away and then called Charlotte and Jerry on the NEST hotline. Nesting Responders crazy enough to sign up for calls 24 hours a day, soon got a wake up call. Rae arrived on scene first to find the nesting turtle just starting to cover up the eggs. Then arrived Kaye and Marilyn and soon Michelle and Mason with KC following up there rear by 4:15 (ok… so she may have accidentally fallen back asleep at first but she did get there in time to see mom swim off into the ocean). Michelle collects the DNA sample. 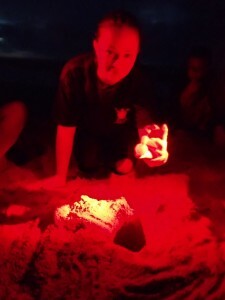 Under the cloak of red light, the team began to interpret where the eggs could be. Another kooky mom who made a tight turn crossing over part of her nest site, it was not going to be straight forward and in the dark of night with a little bit of rain… the team thought they may be there for a while. But shortly after they started and just as Jerry arrived with the stakes, the sand gave way just a little and the egg chamber was uncovered. 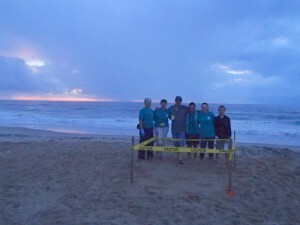 Nesting Response Team finishes up with the start of a beautiful sunrise. The team discussed the need for relocation and after deciding that the nest was above the average high tide line and not in an area known for erosion (at least at this time of year, with luck these hatchlings will be on their way by mid to late August), it was decided to keep it where mom thought best. KC assured the team that even though this nest would probably get some washover, unless a major storm blows through, it shouldn’t be enough to harm the site. So, as the sky began to lighten and the sun began to tease at the horizon, the team marked off the site and took some last measurements and photos. In a NESTer’s book, this defines a good morning.